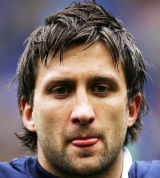 Simon Danielli represented England at students and under-21 levels but in 2003 he opted to play for Scotland and made his debut against Italy in a World Cup warm-up match. He went on to score two tries in Scotland's opening game against the USA and played a prominent role for Scotland throughout the tournament. In September 2004 he joined the Borders having previously played for Bristol and Bath at club level. The Borders club was disbanded in 2007, leading to a move to Irish province Ulster. Danielli continued to be involved in the Scottish set-up but his starts were limited as he vied with rivals such as Sean and Rory Lamont, Max Evans and Nikki Walker to a place in the starting XV. He continued to command a good strike rate in the Magners League for Ulster and was included in Scotland's provisional squad for the 2011 World Cup. Danielli journeyed to New Zealand with Scotland and started two of their games in the Pool stage. Danielli grabbed himself a brace of tries against Romania but failed to make an impact against England as Andy Robinson's side crashed out. Back at Ulster, Danielli was struggling with a back injury and in May 2012, he was forced to call time on his career.